Instead of trying to make my point or to be right, I’ve developed the wisdom to seek to understand more deeply. What are your conversation starters? Effective educational leaders develop, advocate, and enact a shared mission, vision, and core values of high-quality education, academic success, and well-being of each student. In my opinion, no one speaks to the moral imperative of education better than Michael Fullan. Take a look at this short conversation with Fullan and renew your moral imperative and work to realize it through powerful core values communicated and lived in your mission and vision. https://binged.it/2sLqTvR. I view leadership not as a position, but as a disposition for taking action. I am committed to communicating from Quadrant D and supporting others to do the same. According to the International Center for Leadership in Education Quadrant D leadership is the collaborative responsibility for taking action to reach future-oriented goals while meeting the intellectual, emotional, and physical needs of each student. It further notes that when leadership is viewed as a position, the leader is judged by the decision made. When leadership is considered a disposition, leadership is judged by actions taken in the school community. One of our roles in educational leadership is to broaden the definition of leadership to include others who share a common vision. Effective educational leaders act ethically and according to professional norms to promote each student’s academic success and well-being. We all want to belong and feel valued and appreciated for what we bring to the table and for who we are. Commitment to a collective moral imperative with a sense of true belonging can and does move mountains. The students at my son’s schools are encouraged to always choose the hard right over the easy wrong. This quest is evident in nearly everything at the school. Students are empowered to advocate for themselves and for others in ways that challenge their moral compass in very powerful ways. It makes this mom happy! Speak Truth to BS. Be Civil. Effective educational leaders strive for equity of educational opportunity and culturally responsive practices to promote each student’s academic success and well-being. When I was a teacher in Dallas and a principal in Houston, I attended a workshop on expectation theory, Jere Brophy’s Teacher Expectations Student Achievement (TESA.) TESA is a powerful tool to help realize and combat unintentional bias in our school today. I have a renewed interest in this work as I consider culturally relevant practices in schools. In a nutshell, TESA examines how teachers solicit and manage students’ responses to questions, how they give feedback, and how they demonstrate personal regard for students. It’s a philosophy, anchored in the belief that the relationship between a teacher and a student is a key component to academic success. Brophy and Good showed that teachers respond more positively to students they perceive as higher-achieving, in such ways as asking more challenging questions, giving them more time to answer, or being more patient when they misbehave. Over a period of months, teachers in TESA programs learn about 15 pivotal teaching behaviors. They observe one another employing them in the classroom and record the results on a form. 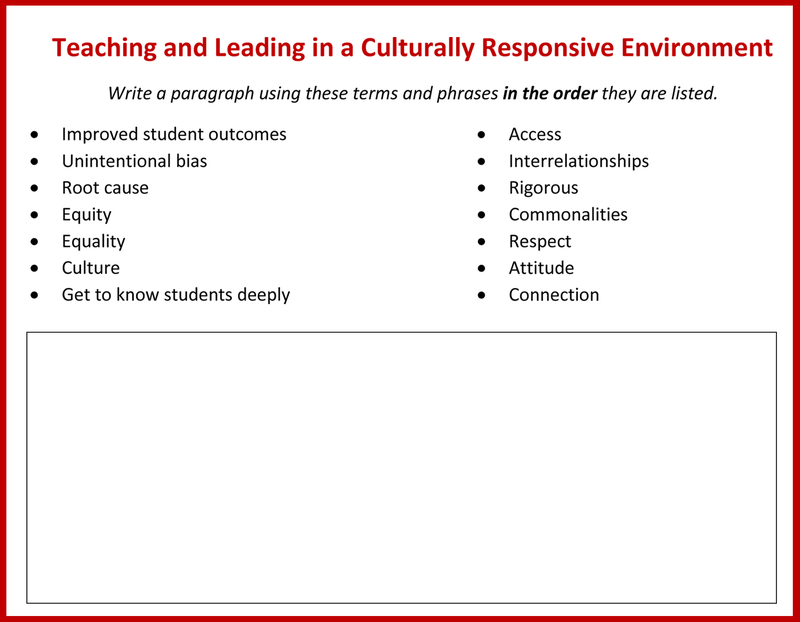 Learn more about TESA and the 15 behaviors than can transform your classrooms into culturally responsive environments with equitable opportunities abound! Check out a summarizing activity I did with my graduate students last semester. The forced paragraph allowed me to check their understanding. So, you’re saying that if you _____________, then _____________. So, you’re thinking that if you focused on _________, your students would be more engaged. I am also reminded of how little things are big things and really matter. I read about this “little thing”after the death of Dwight Clark, and found it inspiring. In the 1980s, the San Francisco 49ers were the dominant team in the National Football League. Two of their stars, quarterback Joe Montana and wide receiver Dwight Clark, were driving together one day when they saw two boys in a yard playing catch with a football. One was wearing a Montana jersey and the other was wearing a Clark jersey. Rather than just pass by, the two stopped their car and played catch with the boys. You don’t have to be a professional athlete to have this kind of impact. Knowing students deeply and really caring can and does leave lasting impressions. Indeed, little things matter. Effective educational leaders foster a professional community of teachers and other professional staff to promote each student’s academic success and well-being. I have just one thing to say – Leaders show up. They show up in mind, body, and spirit and are really truly interested in the lives of others. I believe the ability to build open and trusting relationships is the first and most important step in school leadership and improvement, and it starts with a conversation. The power of a conversation cannot be overstated in my opinion and my experience. This fact is reinforced daily in my work and in my life. Conversations have the power to open minds, share ideas, and lessen heavy loads. They also have the power to close minds, shut down ideas, and increase an already heavy load. I am renewing my idea that the best supervision and evaluation is organic and uses the power of conversation to move people to greatness than on checklists, rubrics, and algorithms and ratings. The real way to change people is by engaging in regular conversation that ignites a spark and stokes the flame. I am in agreement with Farina and Kotch about the importance of engaging in one-on-one conversations to build trusting relationships, learn about each other, and come to common understandings and commitment to goals. Take time to have conversations that deepen your connections and strengthen your relationships. These types of conversations do not include observation checklists or summative evaluation reports, just a piece of paper, a pen, and an open heart and mind. Bazron, Barbara, David Osher and Steve Fleischman. “Creating Culturally Responsive Schools.” Educational Leadership. September 2005, pp 83-84. Blackburn, Barbara. Rigor is NOT a Four-Letter Word. Larchmont, NY: Eye on Education Inc., 2008. Brophy, Jere. “Research on the Self-Fulfilling Prophecy and Teacher Expectations.” Journal of Educational Psychology, Vol. 75, No. 5, 1983. Brown, Brene. Braving the Wilderness: The Quest for True Believing and the Courage to Stand Alone. New York City, NY: Random House, 2017. Farina, Carmen and Laura Kotch. A School Leader’s Guide to Excellence: Collaborating Our Ways to Better Schools. Portsmouth, NH: Heinemann, 2014. Fullan, Michael. The Moral Imperative Realized. Thousand Oaks, CA: Corwin Press, 2010. Heick, Terry. “Equity in Education, Where Do We Begin?” edutopia. January 21, 2015. Jones, Richard, Jose Shannon, and Kathleen Weigel. “Quadrant D Leadership Improving Student Performance Through Adaptive Leadership.” International Center for Leadership in Education, 2014. National Policy Board for Educational Administration. Professional Standards for Educational Leaders, 2015. Rutherford, Paula. Leading the Learning: A Field Guide for Supervision and Evaluation. Alexandria, VA: Just ASK Publications and Professional Development, 2003. Singleton, Glenn and Curtis Linton. Courageous Conversation About Race: A Field Guide for Achieving Equity in Schools. Thousand Oaks, CA: Corwin Press, 2005. 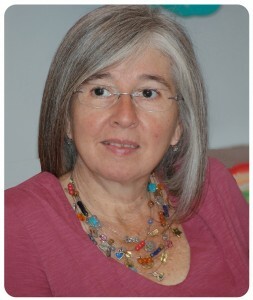 Baldanza, Marcia. “MyThree Rs: Review, Reflection, and Renewal” Professional Practices. June 2018. Reproduced with permission of Just ASK Publications & Professional Development. © 2018 All rights reserved.